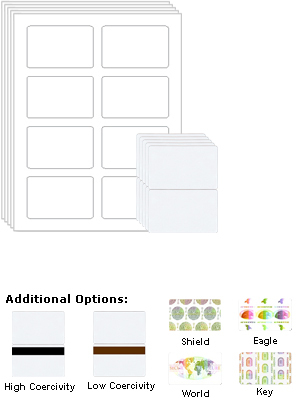 8-up sheets offer the lowest cost per ID card! Our Teslin ID Starter Kits offer a great way to begin making Teslin cards for your small business or organization. Teslin IDs offer an affordable solution for your visual identification needs. Teslin paper allows you to print using any inkjet printer saving you the cost of buying a PVC ID Card printer. The finished Teslin ID card is fully waterproof and the print is sealed under the laminate creating an extremely durable card compared to a PVC ID Card. Each Teslin paper sheet, included in the kit, has eight micro-perforated 2 1/8" x 3 3/8" card inserts. The Teslin paper sheet has a standard size of 8 1/2" x 11". The Teslin inserts will remove cleanly from the sheet and can then be inserted into a butterfly laminate to form a borderless Teslin ID card. The only equipment you will need is a laminator to fuse the Teslin and the laminate together. Check out our How to Make a Teslin ID page for more information. All of our starter kits use a (10 mil) thick Teslin material. You can choose different laminate thicknesses to create a more ridged finished ID Card if desired. (5 mil) laminates will create a (20 mil) finished ID Card which is flexible. (7 mil) laminates will create a (24 mil) finished ID Card which is more rigid. (10 mil) laminates will create a (30 mil) finished ID Card which is a hard card. Should you need a magnetic strip on your ID card we also provide high coercivity (black color) and low coercivity (brown color) magnetic stripes as an option on the butterfly laminate. Once laminated, it will conform to the ISO Specification 7811 in either case. The magnetic stripe is ½” in height. Holograms are a great way to enhance the security of your visual ID cards. Each hologram has a tab to assist in the application to the laminated Teslin ID card. We offer a wide selection of hologram options. Larger images of our holograms can be viewed on the hologram page.